Parsley is one of those herbs that anyone can find almost anywhere, and it’s not too difficult to grow even for those who have ‘normal’ thumbs (instead of green ones). I know because even I can grow it, and if I can grow it, anyone can! My parsley didn’t like to be in direct sun and actually grew much faster with a little bit of shade through the hot evening hours. It grew so quickly that it tried to take over the entire corner of my garden bed. It was great fresh in salads, tabouli, fish, and as garnish, but I finally had to pull some out and dry it. After drying, there was a lot less than I thought! 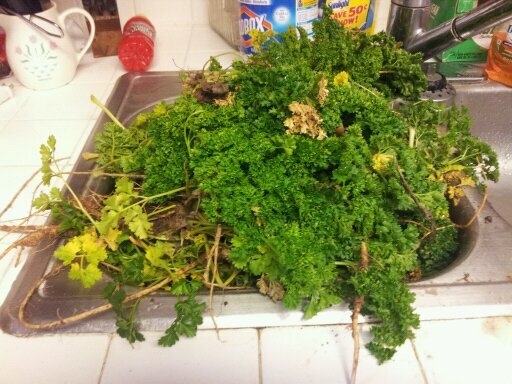 In fact, it takes a LOT of parsley to fill up one of those parsley containers you buy from the store. Try it sometime. You’ll be surprised! So what good is parsley? It is so common that it’s often overlooked for many of its healing and medicinal values. You can make a tea with fresh or dried leaves, and it’s great for a lot of things–even for slowing tumor growth! Eat a sprig of leaf or a twig and chase the stank right out! Is bactericidal and diuretic, so keep it on your shelf! Support thy glands with no restraint! It is one of the 7 greatest treasures to be found. Give parsley its valued crown.